Since they founded Neri&Hu Design and Research Office in Shanghai in 2004, Lyndon Neri and Rossana Hu have been working with some of the world’s most celebrated hoteliers and restaurateurs like Ian Schrager, Jean-Georges Vongerichten and Jason Atherton to create entire hotels and restaurants, as well as custom furniture pieces and tableware for their projects in and around China. Now with multiple awards and accolades under their belt and a client base that covers almost every corner of the world, the founders of this multi-disciplinary firm tell That’s about some of their most recent projects like The Sukhothai Shanghai, The Shanghai EDITION, and Tsingpu Yangzhou Retreat, their thoughts on demolitions happening around major Chinese cities, challenges Chinese architects and interior designers face in this day and age, as well as literature and music in which they find design inspirations. Tsingpu Yangzhou Retreat. Image by Pedro Pegenaute, courtesy of Neri&Hu. What is the design philosophy behind the work of Neri&Hu? Architecture and design are powerful cultural forces. We believe in the subtext over the obvious, and the poetic over the utilitarian. While the functional aspects are less interesting for us, designs must also be realistic and practical. Most of our projects, from The Waterhouse to the new Tsingpu Yangzhou Retreat, deal with the concepts of bridging the gap between the East and West, and the past and future. These seemingly diametric opposite issues are constantly seen in many of our projects for both architecture and interiors. 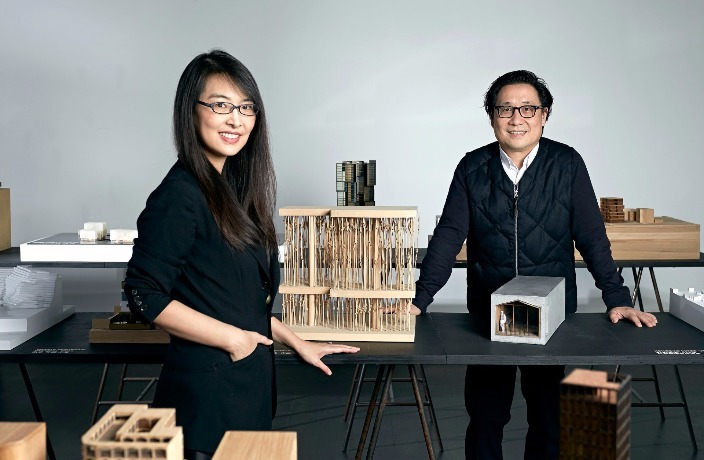 When you started Neri&Hu, why did you choose to establish the firm as a multi-disciplinary practice spanning architecture, interior design, product design and graphic design? We see design as a holistic discipline, and interdisciplinary research is part of our design process. It is intrinsically intertwined with every project from the start. Architecture, however, is still the foundation of everything we do, so it is the most important for us. The Shanghai EDITION. Courtesy of Neri&Hu and The Shanghai EDITION. You’ve had a few high-profile hotel projects unveiling this year. Can you share some of your favorite aspects about working on these? For The Shanghai EDITION, it was great to have the opportunity to work with a visionary hotelier like Ian Schrager and we were extremely honored that he picked us to design his Shanghai flagship hotel. Meanwhile, trying to create an urban oasis in a frenetic urban condition in the middle of Shanghai for The Sukhothai was harder than we had anticipated, but it was definitely a good challenge and experience. As for the Tsingpu Yangzhou Retreat, we have been consciously doing projects outside of the city and this was one of those opportunities that allowed us to really push ourselves to blur the boundaries between the architecture and the landscape. How selective are you in terms of the projects that you undertake? We get a lot of requests every month from all over the world, but we can only take a few at a time. We have to be extremely selective because we only have limited time, and we like to stay on top of every project. The Sukhothai Shanghai. Image by Pedro Pegenaute, courtesy of Neri&Hu. What are some of the major changes that you’ve seen in China’s design and architecture scene over the past 14 years? Compared to back in 2004, there are so many good Chinese architects that are doing very interesting work today: Atelier Deshaus, Vector Architects, Amateur Architecture Studio, Standard/Architects, MAD Architects, Open Studio are just a few examples. If we were to start today, we probably would not survive. On the other hand, clients have also become savvier and appreciate design more, which is a positive thing. As an architect, what do you think about all the demolitions happening in major Chinese cities to make way for modern development? When we first started our practice, we were appalled at how buildings and neighborhoods were being destroyed. We believe buildings have memories and by demolishing them, we’re erasing a part of the city’s history. Many of our projects including the Waterhouse, Design Republic and the Split House all addressed these issues. Having said that, we also believe that there needs to be a balance. We do think that the city planning board has become a lot stricter and many of the buildings currently being demolished are poorly built structures. Design Republic Design Commune. Image by Pedro Pegenaute, courtesy of Neri&Hu. Are there any trends in architecture and interior design that you’re not a fan of? We are not interested in architecture that is purely used as a spectacle, without spatial and tectonic sensibilities. In terms of interior design, we absolutely hate projects that are purely decorative. Has the rise of social media changed the way you approach your designs? Not at all. Aesthetic and practicality should be seen as one, as opposed to two separate issues. As an architect in this day and age, what are the biggest challenges that you face? The fact that there are many projects and they are all being built is both a blessing and a curse for many architects practicing in China today. The biggest challenge is to be rigorous with our conviction and to not lose focus. The Waterhouse at the South Bund. Image by Pedro Pegenaute, courtesy of Neri&Hu. You’ve previously mentioned that literature, music and films serve as important design inspirations for you. Can you give us an example? There are a lot of books that deeply influenced us. An important one is Italo Calvino’s Invisible Cities (a travel-themed novel published in 1972), a book that we have read many times since college. It served as the premise of our design concept for the Waterhouse, which was based on the idea of travelers entering into a certain realm of dreamlike fantasy, just like how the characters in the book engage with the city that they are in. We wanted travelers who come to Shanghai to engage in their own fantasies in the space we created. At the moment, what are you both reading and listening to? The Broom of the System by David Foster Wallace (Lyndon Neri); Ruins: Documents of Contemporary Art by Brian Dillon (Rossana Hu); Mahler: The Complete Symphonies (Rossana Hu). What are some upcoming projects that you’re working on? In China, we’re working with Ian Schrager for an EDITION hotel in Wuhan, a few projects in Zhengzhou (including an office building, a civic center and two hotels), a restaurant with Andre Chiang in Chengdu, a hotel in Sanya, a resort in Moganshan, an ancestral hall in Beijing and an interior residential project in collaboration with Richard Rogers in Shanghai. Elsewhere, there are hotel projects in London, Doha and Ibiza, a seven-story building containing a hotel and retail for LVMH and Dacra in Miami, a contemporary art museum in Kuala Lumpur, and a house for acclaimed film director Vinicius Coimbra in Rio de Janeiro, among others. Image by Andrew Rowat, courtesy of Neri&Hu. Cover image by Zhu Hai, courtesy of Neri&Hu. The Danish designer on his body of work and similarities between Scandinavian and Asian designs. We chat with the entrepreneur on his mission to bring balanced nutrition and wellness to busy working professionals. That's speaks with Chef Ben Wong of the JW Marriot Macau's Man Ho Cantonese Restauarant. Zhou tells That's about the trends he noticed while attending this year's fashion events, as well as his favorite city to shoot in. We sat down with Tim Pope, the founder of the newest and most popular sporting craze in Shanghai: the Hungover Games. To be unveiled on December 2. Copper pipes serve as the main design plotline at this new movie theatre in Shanghai.